TouchClean® anti-bacterial coating goes from strength to strength. Since the launch of the high tech nanotechnology anti-bacterial coating TouchClean® it has become a best selling product. Now used in many schools, hospitals and other institutions where it is a silent guardian working a 24 hour seven day a week shift to protect people against viruses, bacteria and mould organisms. 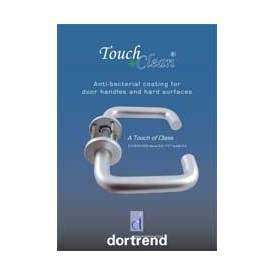 TouchClean® is available as a ready applied invisible coating on all Dortrend’s products but can also be applied by spray coating to almost any surface where its photocatalytic action is powered by Ultra Violet frequencies in daylight or artificial light enabling it to destroy bacteria, spores, viruses, mould, odours and pollutants. 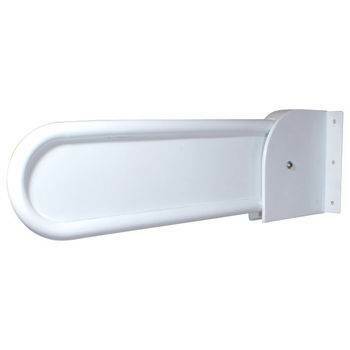 It avoids the need for chemical cleaning and the by-products are harmless. Once applied it is presents no hazards to people or animals and goes on protecting for many years. 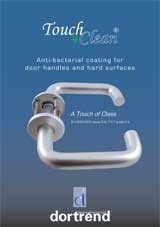 Originally developed by Dortrend as a coating for door furniture, there are versions of the coating specially formulated for application to walls, doors, floors, equipment and clothing, making it an ideal component of general anti-bacterial programmes in hospitals, care homes, detention centres and other places where vulnerable people are cared for. The coating is also applicable where people congregate, such as buses, trains, nightclubs, cinemas, taxis, canteens and restaurants as well as where antibacterial control programmes are indicated including, doctors surgeries, dental surgeries, schools and nurseries. A recent development is TouchClean® for glass. When applied to new or old clean glass the coating is invisible but stops a build up of dirt on the glass, eliminating the need for cleaning. This is particularly useful in difficult to reach locations. TouchClean® can be used to protect against a broad range of pathogens and is effective against MRSA, SARS, c. difficile, e.coli, as well as the much publicised swine flu. TouchClean has been tested to EN13697:2001 - A stringent testing method for chemical disinfectants and antiseptics. It is a quantitative non porous surface test for the evaluation of bactericidal and/or fungicidal activity of chemical disinfectants used in the food, industrial, domestic and institutional areas. The test was carried out by applying the product to a metal surface to replicate the actual use and MRSA bacteria were added to this surface for the test. Users should be wary of tests that have been carried out in aqueous environments (adding to bacteria in a body of liquid) as this does not reflect actual conditions in use. A copy of the test certificate in available upon request.